Length 8:43 min. 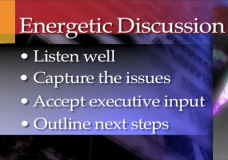 “Energetic Discussion” What to do when things go right in executive presentations. Speaking Up! Presenting to Executives is an E-Learning streaming, on-demand module for successfully navigating presentations to senior management. The full E-learning module has over two and one-half hours of original video programming. Client: PowerSpeaking, Inc., 2013. Length 8:00 min. 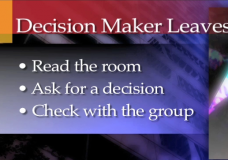 “Decision Maker Leaves” What to do when the decision maker leaves the meeting. Speaking Up! Presenting to Executives is an E-Learning streaming, on-demand module for successfully navigating presentations to senior management. The full E-learning module has over two and one-half hours of original video programming. Client: PowerSpeaking, Inc., 2013. Length 12:17 min. 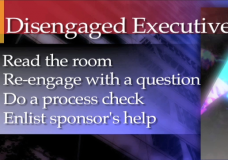 “Disengaged Executives” What to do when the executives disengage and spend more time on their Blackberries. Speaking Up! Presenting to Executives is an E-Learning streaming, on-demand module for successfully navigating presentations to senior management. The full E-learning module has over two and one-half hours of original video programming. Client: PowerSpeaking, Inc., 2013. Length 2:17 min. 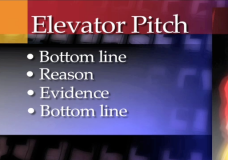 “The Elevator Pitch” Speaking Up! Presenting to Executives is an E-Learning streaming, on-demand module for successfully navigating presentations to senior management. The full E-learning module has over two and one-half hours of original video programming. Client: PowerSpeaking, Inc., 2013. Length 10:21 min. 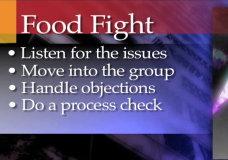 “Food Fight” What to do when the executives start fighting among themselves. Speaking Up! Presenting to Executives is an E-Learning streaming, on-demand module for successfully navigating presentations to senior management. The full E-learning module has over two and one-half hours of original video programming. Client: PowerSpeaking, Inc., 2013. Length 10:04 min. 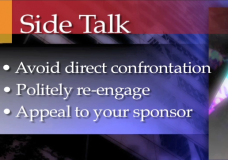 “Side Talk” How to handle ‘side talk’ in an executive meeting. Speaking Up! Presenting to Executives is an E-Learning streaming, on-demand module for successfully navigating presentations to senior management. The full E-learning module has over two and one-half hours of original video programming. Client: PowerSpeaking, Inc., 2013. Length 11:49 min. 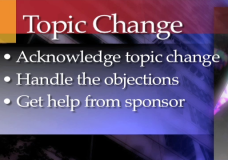 “Topic Change” What to do when the executives change the topic. Speaking Up! Presenting to Executives is an E-Learning streaming, on-demand module for successfully navigating presentations to senior management. The full E-learning module has over two and one-half hours of original video programming. Client: PowerSpeaking, Inc., 2013. Length 9:22 min. “Time Cut” The most common problem of all – how do you handle the presentation when your time gets cut? Speaking Up! Presenting to Executives is an E-Learning streaming, on-demand module for successfully navigating presentations to senior management. The full E-learning module has over two and one-half hours of original video programming. Client: PowerSpeaking, Inc., 2013.